Why celebrating Women in Leadership? When we reflected on the four waves of feminism, we realized that even though 2018 was coined as the year of women with movements such as the #MeToo and #TimesUp, we still have a long way ahead of us. There is still a lot of disparity at the workplace, where women are not being equally treated nor equally paid, especially at senior levels such as the C-Suite and board levels. We also believe that some organizations look at gender diversity as a way to reach a certain quota or as an act of tokenism, rather than thinking strategically about the real impact of their contributions. We know that women’s leadership attributes are maximized not only when they're given access to the boardroom, but also when they're included in decision making. Their high level of emotional intelligence, creativity, and innovation, contribute largely to the success of an organization, its sustainability, and impact. Women in leadership positions in Canada - What impedes women from being in leadership roles? The 2018 Rosenzweig report examines the top 100 largest publicly-traded corporations in Canada, based on revenue, and how many top leadership roles are held by women. Their report examined 540 Named Executive Officers (NEOs) at Canada’s 100 largest corporations. NEOs are the Chief Executive Officers (CEOs), Chief Financial Officers (CFOs), and other C-level executives named in a corporation’s management circulars. Their research found that of 540 executives, 51 are women and 489 are men. This year’s progression indicates that female participation is at a new high of merely 9.44%, up from 9.02% the previous year. The report also notes that more than 60% of university graduates are women, and social movements such as #TimesUp and #MeToo have gained widespread support on social media and in pop culture. These numbers and movements have brought renewed importance to the call for wider female participation in leadership roles. If we look at the reason behind the low rates of female representation in leadership roles, we can see a troubling trend. Due to socially-constructed beliefs and often complex circumstances, women take on the responsibility to care for their family & children, and this is even today, considered as the primary role for women. Therefore, getting back or being in the paid workplace is considered an ‘additional’ or ‘side’ responsibility only. This makes it even more difficult for women to move forward with their careers. These false beliefs, among others, contribute largely to the gender disparities at the workplace. In the corporate world, C-suite or senior management level positions are predominantly occupied by men. Lack of representation translates into lack of awareness of the positive impact of female In the corporate world, C-suite or senior management level positions are predominantly occupied by men. Lack of representation translates into lack of awareness of the positive impact of female leadership. Lack of awareness translates into a lack of visibility and future consideration. Women have to break through the ‘glass ceiling’ to be able to move up the corporate ladder. And even if they do get a seat at the table, this is often seen as an anomaly rather than the ideal norm. All of these and many other complex reasons translate into organizations believing that women are simply not suited for the C-suite when the truth is a lot more complex and nuanced. Adopting policies that support women in leadership roles, and promote gender diversity and inclusion on boards and C-Suite levels. Organizations also need to adopt policies that support working moms and all types of women. Publically celebrate and recognize companies and organizations that support their own female employees and female senior-level leaders. Women need to support each other instead of competing for one seat at the table. Doing so reinforces the “it’s an anomaly” perception and further cement the glass ceiling. Advocating and championing for more women to be included and heard not only benefits the organization but helps everyone's professional and personal growth. Organizations need to adapt to the changing workplace. Millennials are now dominating a lot of industries and they have different mindsets. They thrive on diversity, inclusiveness, and true equity. Organizations would need to put new strategies in place that respond to the new culture brought by Millennials. A culture that fosters ethical decision making throughout the organizations, and rejects inequality in all its forms. Women striving for more management responsibilities, often feel pulled in multiple directions between personal and professional lives, and this creates ‘confidence crisis.’ By reinvigorating mentoring, coaching and development programs, companies can help women build a path to achieve their leadership goals. Change comes from within and cultivates in a supportive and nurturing environment. Join us in celebrating women in leadership this week, they are the role models, trailblazers and an inspiration for many others. Only if we stand together, shall we succeed together. One of the theme’s for our #CelebratingUs month was Unsung Heroines - this theme is quite close to our hearts, as it is dedicated to celebrating the unnoticed, unpraised and unsung efforts and achievements of great heroines. These heroines regardless of their industry, field, specializations, engaged in struggles and realized that a better world is possible - if not for them, for generations to come. Many women played important roles in the Civil Rights Movement, from leading local civil rights organizations to serving as lawyers on school segregation lawsuits. Their efforts to lead the movement were often overshadowed by men, who got and still get more attention and credit for its successes in popular historical narratives and commemorations. One of the many women who led the Civil Rights Movements, her name is Ella Baker. Ella Baker was an outstanding African-American civil right and human rights activist in the United States. Her career spanned more than five decades. She was highly respected for her “behind the scenes” advising, supporting, and mentoring greats like WEB Dubois, Thurgood Marshall, Martin Luther King Jr, and Rosa Parks. Baker is known for her critiques not only of racism within American culture but also the sexism and classism within the civil rights movement. The history of science is usually portrayed as the history of male scientists. But women have also played crucial roles in science from the world's first chemist more than 3,000 years ago to a 2018 physics Nobel laureate. Women remain underrepresented in the science and engineering workforce, although to a lesser degree than in the past, with the greatest disparities occurring in engineering, computer science, and the physical sciences. Unfortunately, the underrepresentation of women in these crucial decision-making fields has had a wider impact than you may realize. Although women, we still have a long way to go to earn our fair share in the STEM field, we are still blessed to have many trailblazers, who created the space for us and many generations to come to forge ahead. Katherine Johnson is an unsung heroine. As an African-American NASA Space Scientist, she was awarded the Presidential Medal of Freedom in 2015 for a lifetime of work as a pioneering physicist, mathematician, and space scientist. She and her colleagues, Dorothy Vaughan and Mary Jackson did the calculations that guided NASA’s 1962 Friendship 7 Mission. A teacher and research mathematician, she co-authored over 25 scientific papers. About as unique as an African American woman scientist at NASA in the 1950s. She was both—making her the rarest of the rare! The UN has unveiled a campaign to highlight the role of women in peace-building and conflict resolution — hoping that their largely unsung work in Iraq, Yemen, Syria, Libya, and Palestine will inspire others. Studies show that women have a highly influential role to play when it comes to standing up to violent extremism or pushing for reconciliation: negotiated peace agreements have a 25 percent to 50 percent likelihood of failing when women are not involved in political processes and peace talks. Without involving women in peacebuilding, we cannot lay the foundations for lasting peace. And without peace, there can be no sustainable development. Shirin Ebadi is an unsung heroine. She is an Iranian Lawyer, a former judge, and human rights activist, and founder of Defenders of Human Rights Centre in Iran. On 10 October 2003, Ebadi was awarded the Nobel Peace Prize for her significant and pioneering efforts for democracy and human rights, especially women’s, children’s, and refugees’ right. She was the first Iranian and the first Muslim woman to receive the prize. In 2004, she was listed by Forbes magazine as one of the "100 most powerful women in the world".She is also included in a published list of the "100 most influential women of all time." Apart from peacebuilders, we also want to take the time to celebrate displaced persons and women refugees, who are not only suffering from post-trauma conditions but also have become the main breadwinners to support their families & children because their men are either in prison/fighting or missing. Their sacrifices will never be forgotten. When it comes to Canadian history, we cannot but admire the great efforts & appreciate the struggles of indigenous women, immigrants, domestic workers, and human rights activists. All these sung and unsung heroines played an important role in writing the Canadian history. One of the unsung heroines we’d like to highlight is Ruth Gorman. Born in Calgary in 1914, she charted a course that society might not have expected of a debutante. She earned a law degree, became one of the very few female lawyers in the province in the 1940s, and played a largely unheralded role in the fight for Indigenous rights in Alberta and Canada over the decades to come. Her lifelong mission is to correct the injustices in Canada’s treatment of Indigenous People. She deeply believed that Canadian society was not living up to their treaty obligations and at no time, believed that she was engaged in “uplifting” the Aboriginal condition. Until her death in 2002. Gorman worked passionately throughout her life to right injustices that she saw in our community in order to make it a better place. Join us in celebrating domestic workers, who despite the low income and “sometimes” hazardous working conditions, still worked in white women’s kitchens, nursed their children and raised many generations. Your sweats, tears, efforts, smiles and time are of great value to all the generations you’ve raised & cared for, and to us all. Think of all the volunteer heroines around you. From firefighters to patrons of the art, to social workers, to nurses, all these volunteer heroines have greatly impacted our lives. Their valuable efforts and time made our lives easier, healthier, happier and for this, we’re forever thankful and grateful. Join us in Celebrating YOU! Yes, you’re all unsung heroines in all the different roles you play. This weekend, I saw one of my best friends get the biggest news of her life so far when she got a letter from the Canadian Government offering her permanent residency in Canada. Born in Jamaica to middle-income parents, she has spent the last two years struggling with finding a job, a place to stay and working her way through the bureaucracy of citizenship, all while facing the emotional roller-coaster of leaving her home and parents behind. It is not a easy task to uplift your life in the way she did, and I commend anyone that has accomplished such a feat. That is why we are choosing to celebrate the newcomers to Canada. In the face of growing adversity, we see a population ready and willing to chase the Canadian Dream. Immigrants play a vital role in keeping our population alive and thriving. As it stands, immigrants make up 22% of the Canadian population and are responsible for 71% of the population growth. With an ageing population and low fertility rates, immigrants have become vital to maintaining the Canadian population and its workforce, which is estimated to need another 350,000 annually to meet workforce needs. Immigrants bring with them diversity in both culture and knowledge, and have a tendency to be motivated, innovative and entrepreneurial, helping to drive business and trade between Canada and origin countries. Not only do immigrants play a vital role in Canada’s identity, but our acceptance of newcomers on humanitarian grounds demonstrates Canada’s compassion and leadership on the world stage and enhance our global standing. Immigrants play a huge role in boosting Canada’s performance in the realm of innovation. According to the Conference Board of Canada, Canada’s innovation performance ranks 14th out of 17 industrial counties in their How Canada Performs Innovation report card. Acting as a source of diverse knowledge, The report suggests that at least 35% of Canada Research Chairs are foreign born even though immigrants only make up one fifth of the population. However, immigrants, especially women still face challenges in their ability to display their genius in the workforce. However research continues to show that matching an organization's workforce to its clientele. The Right Honourable Adrienne Clarkson is one of Canada’s most well-known immigrants, having served as the 26th Governor General of Canada as well as spending years as a CBC journalist. Known for having brought a new energy to the position, Clarkson was dedicated in her passion for the arts and sports, having created the Clarkson Cup for women’s hockey in September 2005. However, immigrant women are still at a disadvantage to both immigrant-men and Canada-born women, even the immigration process itself is biased. By focusing on economic criteria, education, professional experience and official language ability, the application process disproportionately benefits men, especially from countries where women have less access. When women do immigrate to Canada, many of them do so under the “family class” which impacts their social and economic position in Canada. When the do get to Canada, immigrant women are often paid less and more likely to have their education discounted. According to Immigration, Refugee and Citizenship Canada, visible minority newcomer women have one of the lowest annual incomes of a minority population making only $26,624, compared to visible minority newcomer men who make $35,574. Employment is key to successful integration in a new country, however many newcomer women report feeling denied opportunities because of their skin colour or accent. Management and human resource professionals should work to diversify hiring practices to include newcomer women. Employers should allow for domestic/sexual violence leave as these are issues disproportionately faced by newcomer and racialized women. Companies need to value both physical and mental health in their workers. Government should address precarious working conditions as newcomer women often take up the lowest paying jobs (i.e. retail, cleaning services, etc.). Newcomer women are already at an economic disadvantage due to the immigration process and so need higher paying jobs to establish economic independence. In the face of growing tensions regarding immigration in countries like the US and even in some parts Canada, it is important for us to remember that almost all of us are ourselves immigrants or descendants of ones. We have no greater claim to this land than someone born in Syria, we were just lucky enough to be born here. Success doesn’t happen overnight, nor in isolation. Each of us had mentors, champions, friends, family members,and advocates. Those that, at one point or another inspired us, propelled us, and helped us move forward. We have also played that role for others. We have lent a sympathetic ear, have helped others in tough times. We have assisted & motivated each other as we work in the long path of becoming the best version of ourselves. I started my adventure of finding my true self after stepping on the Canadian land three and a half years ago with all the unknown and uncertainty. As a newcomer and immigrant, finding a community and also that sense of belonging is significant to me. Through my time in Toronto, I have been volunteering in quite a few women-focused Non-Profit Organizations, however, no matter how great the event experience was, there was still something missing. Until recently as an unexpected opportunity, I joined Young Women in Business (Toronto Chapter - YWiB) as the Programs Manager. After attending a few networking events and team meetings, I realized that this was the genuine and authentic connection I was missing. YWiB assembled this puzzle piece for me. We recently conducted our first 2019 networking event in February which turned out to be a huge success. 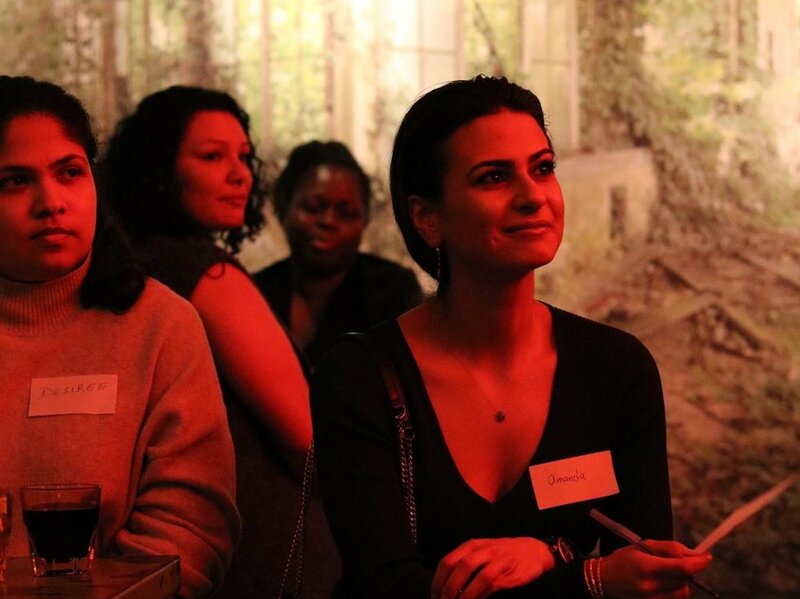 There were about 35 bright young women who joined us for a night of mingle and networking. The event took place at the Open House, a cozy crafted beer bar on Bloor Street West. With the assistance from YWiB team members, the ambiance was warm enough that our guests easily ease into the networking session. To make this experience a memorable one, Zenia our Social Media Coordinator wonderfully facilitated a special session by asking attendees to write down three things that they would like to share/discuss with others at the event. It was such a great way to break the ice and quickly allow everyone to engage with others they met the first time. I got an opportunity to talk to one of the attendees and exchanged questions. It was her first YWiB event experience, and she was completely amazed by the positive energy in the room and very happy that she had this opportunity to build rapports with like-minded women. Towards the end of the event, we witnessed how amazing and responsive our attendees were! Our team received overwhelmingly positive words of encouragement from them. What a way to end an event! We truly appreciate the acknowledgement and feedback from each of our attendees and members. As a young organization, YWiB still has a lot of growing need to be done. However, as a team, we are full of hope because we have the things that we need to succeed - a clear mission and a group of women who are dedicated to lift each other up and make a difference. If you are passionate about growing professionally, advancing in your career while belonging to a wonderful community, I welcome you to join our next event or simply check out our website as we are currently hiring! Don’t hesitate and be afraid, Why wait? NOW is the time to work, change, and make an impact. YWiB TO Holiday Contest is ON now! Yep, you heard right. Grab your gal pals, and start planning your weekend getaway because now you’ll have the one thing you were missing: a super stylish carry-on luggage! Whether you and your girlfriends want to hit the slopes in Whistler, check out Montreal for a fun-filled weekend, or take off to sunnier weather to escape the Winter blues, we got your luggage needs covered. Enter our Holiday Contest and stand a chance to win your very own cool carry-on luggage! So, don’t delay - hurry up and participate, and spread the word among your girlfriends! Contest ends at midnight on December 8th. For Terms & Conditions, check out our Facebook notes or go through the link in our Instagram Profile Bio. 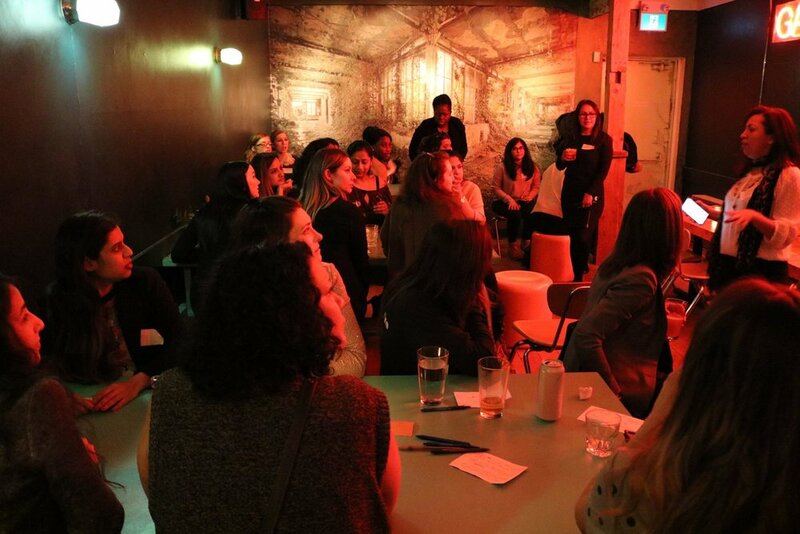 If you’ve attended one of our Networking Nights recently, you’ve probably met Sindhu Jawed, either in person or heard her pitch to a room full of women. Never one to back away from an opportunity to discuss her current project Jarsss, which is launching this weekend at the Liberty Village Holiday Market, we here at the YWiB community thought it would be a perfect time to shine a spotlight on one of our amazing members. 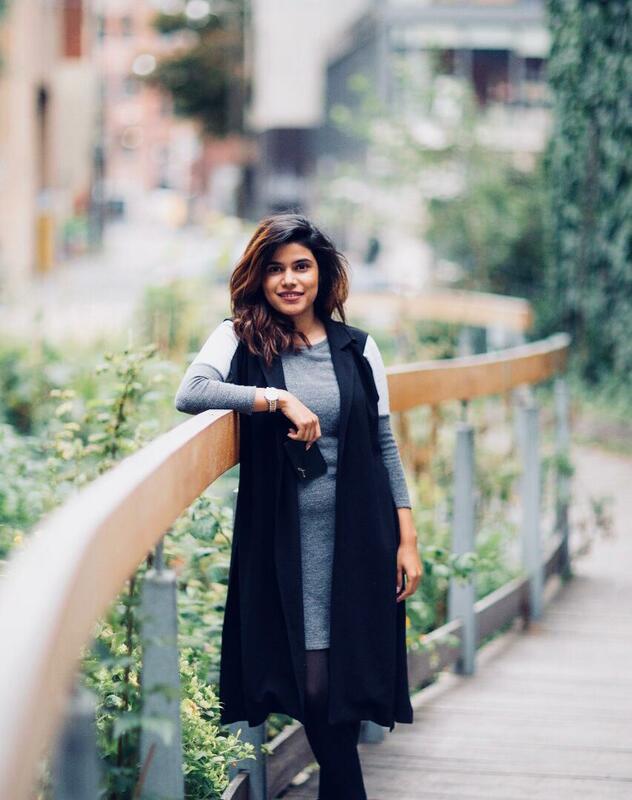 Not only is she a philanthropist, but shes an all around BOSS, but she is creating change that is having an impact in both Canada and Pakistan. Jarsss is a lifestyle brand, it’s a company, and its a story. At Jarsss we specialize in creating affordable leather goods that are socially impactful. Our products are designed in Canada and produced in Pakistan. Our social impact begins when you purchase one of our leather goods because we utilize our profits to fund the education of underprivileged children in Pakistan. With Jarsss, you are not just carrying a quality product, you are part of our story. How have your life experiences led to the creation of Jarsss? Jarsss has spun out of my other social impact projects and it's now my main focus. At the age of 17, I started a non-for-profit in Pakistan as a result of my own hurdles with access to education. At that time, I had been self-teaching for a few years and began Asro which focuses on making education accessible to students who either can’t afford to go to school or who live in areas where safety is an issue. From my work in the social sector, I was able to secure a full scholarship to attend university in Canada whereas before this, I was not sure if I was going to pursue further education at all. This experience taught me the value of education and how some opportunities can be life-changing. With the continued commitment and efforts of the team, today, Asro is 7 years old, has a running and operations team in Pakistan and this year alone it has sponsored 50 students to go to school. However, finding sustainable funding models for non-profits is a common organizational resiliency strategy. To be able to continue this work, which has created a difference in the life of many, I decided to found Jarsss. Pakistan is a world-leading producer of fine leather, so by combining my country’s common export, my philanthropic mission and my passion for good design, Jarsss is creating products that are functional and tied to the community. While at the same time the profits are impacting and driving social and financial change. How have you been able to combine your profession and passion for philanthropy? My current professional role is Community & Operations Associate at Venture for Canada. I believe that VFC is an organization that lives and breathes impact. I’m grateful to be a part of an organization that has the mission to foster entrepreneurship in Canada for a more inclusive, diverse and innovative country. I have been able to combine my passion for social impact by working closely with program beneficiaries as our programs, training, and community development projects strive towards fostering entrepreneurship in Canada. I work closely in facilitating opportunities and generating content for entrepreneurs and young Canadians who want to make an impact on the future of work and business. I have the opportunity to work closely with folks who see my vision and support my efforts. Having said that, it is unrealistic to say that managing a full-time job and a side hustle is easy. Since I have a supportive team both at VFC and at Jarsss, I have been able to manage both successfully. What are some of the challenges you’ve faced with launching Jarsss? From picking the right manufacturer to making sure the quality of the material is top notch, every stage of the production process to the export process has presented its own challenge. One of the challenges that I’ve encountered was making the assumption that all the products that we’ve designed and sent for production matched the quality standards we had set for our brand. Having failed to test the products ourselves, we lost time and investment in products that did not function as desired. This, of course, is the result of other challenges including working in different time zones and having hard timelines. That being said, this challenge was an oversight and we take each challenge as an opportunity to learn. After this experience, we’ve adjusted our production line and process, allocated at least 2 weeks to test our products for functionality, to then make notes and suggestions for improvements before launching into the manufacturing of the final product. The drill is to make, fail, learn and repeat. How do you see Jarsss growing in the future? My goal is that Jarsss will become recognized as a brand equally for its design and quality, as well as its drive to support social missions. Jarsss will stay true to its design vision but will continue to grow with its global impact as the plan is that it serves as a sustainable revenue source for other causes. This week, I’m preparing for the official launch of Jarsss. It’s a really exciting time as this is the final stage of the conceptualization, design, and execution of the idea! For the very first time ever, Jarsss products will be available for purchase at the Liberty Village Holiday Market located at 99 Sudbury St. on Sunday December 2nd. How has the YWiB community helped you? The YWiB community has helped me in countless ways. One fun fact is that the first time I pitched Jarsss, it was at the networking event in front of 50 women who are part of this community. Everyone was so supportive and encouraging. I joined YWiB when I was in school in Vancouver and not only did I find an incredible group of supporters but I also got connected to very smart, driven and ambitious women in the industry I wanted to break into. I particularly enjoy the monthly networking events and workshops focused on different topics. If you are looking for a community of like-minded and driven women, I’d strongly encourage you to join YWiB, the team is welcoming and strives hard to provide you with resources that can help you grow both personally and professionally. What advice would you give other women looking to start a philanthropic project? It’s magical to create something that shapes other people’s lives. I encourage everyone to take an initiative and hustle hard. The key is to surround yourself with people who can support, mentor and encourage you to push your boundaries. The only reason I have been able to come this far is for all the people who have consistently supported me in this journey. I’m happy to connect with anyone curious to learn about my journey or Jarsss, shoot me an email at sindhu@jarsss.ca and we can grab a coffee! Sindhu is a recent graduate from the University of British Columbia with a degree in Economics, Business, and Philosophy, where she studied on a full scholarship. Currently, she works as a Community & Operations Associate at Venture for Canada. At the age of 17, Sindhu started a Non-Profit focused on making education accessible to children from underprivileged backgrounds in Pakistan. Today, the organization is 7 years old and this year alone has sponsored 50 students to attend primary school. Sindhu is also a member of Global Shapers, an initiative of World Economic Forum and was featured in Rich Thinking, the eighth global study in the Rich Thinking series about Smart women and risk-taking. She loves to travel, talk about entrepreneurship, and is passionate about building communities.